Good news! The PLSDSP live EP is being mixed & we expect to have the recording out to donors this month. Public release (for free of course) will follow a few weeks after that. And yes, it’s unfortunately just an EP. We had unrecoverable recording errors on the second half of the show, so this will just be the first 5 songs and a little bit of video. There is a little orchestra in those first five tracks, but not a ton, which is disappointing. It is definitely better than nothing, and doing a “one night only” event meant we were always running a risk of something going wrong. And hey, it did! All the more reason to do it again, right? Alas, we just can’t afford that; we used the donations to do it once, and we gave the remainder to the Awesöme Orchestra Collective as promised. Maybe someday we can make it happen, knowing what we know now! 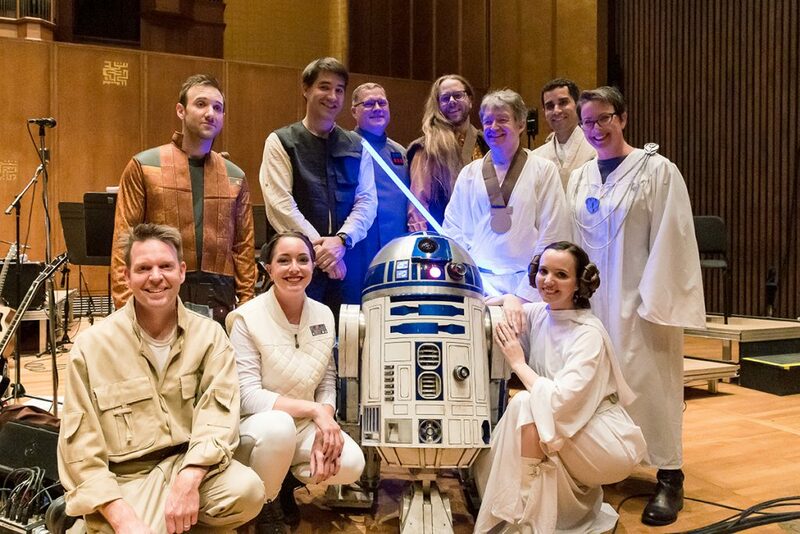 Last night’s live performance of Princess Leia’s Stolen Death Star Plans with Awesöme Orchestra Collective was everything we’d dared hope it might be — an inspiring night of making music for and with an audience, taking our silly idea to its unlikely sophisticated conclusion. We were thrilled at how it went, and we can now confirm that there is no better way to make your live debut as a band by playing with a 90-piece orchestra. Really not bad for our first gig. And of course, we appreciate everyone who gave this event time, money, or attention. To us, it’s like we haven’t shut up about it for six months, but we knew we had one shot at this, and we really did need all the help we could get! So if nothing else, thank you for enduring our fundraising campaign. We were not only able to cover our costs but we’ll be donating the additional funding directly to AO so they can continue their musical adventures around the Bay Area. We will release much nicer photos, audio, and video as we get them cleaned up and edited, but here are a few of our behind-the-scenes shots — they do not do justice to the energy in the room and the positive, collaborative spirit of everyone involved. Our hope is to release the concert as a live album, free as usual. Watch this space. We’re going to take a nap. 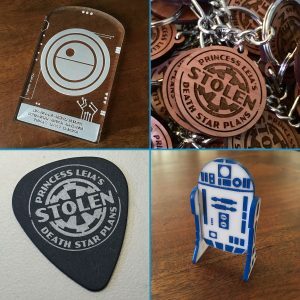 What’s in the PLSDSP Live souvenir pack? UPDATE: The VIP Plus sections and souvenir packs are solid out and no longer available. Thank you so much for your support! 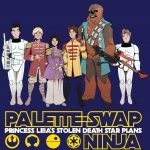 PLSDSP Live – Fundraiser T-shirts are here! 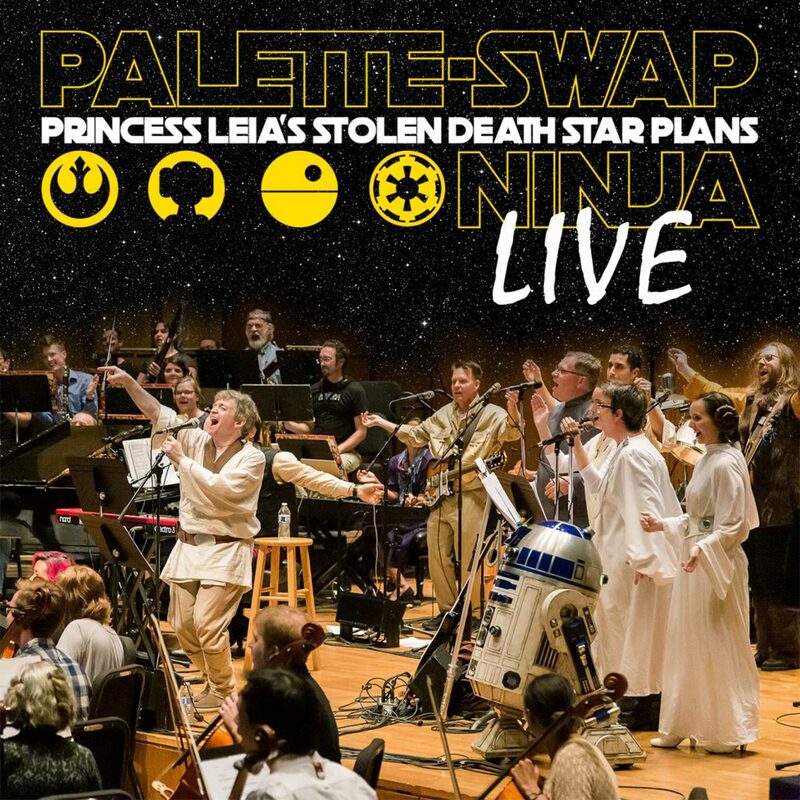 So we’ve mentioned we’re performing Princess Leia’s Stolen Death Star Plans live with an orchestra in October, right? Well, we are also trying to raise some money to cover our costs and make that gig all it can be. We’ve got ticket information here, and of course a PayPal tip jar here, but if you’re one of those people who likes physical souvenirs, we’ve got you literally covered. Behold the limited-edition PLSDSP fundraiser t-shirt! 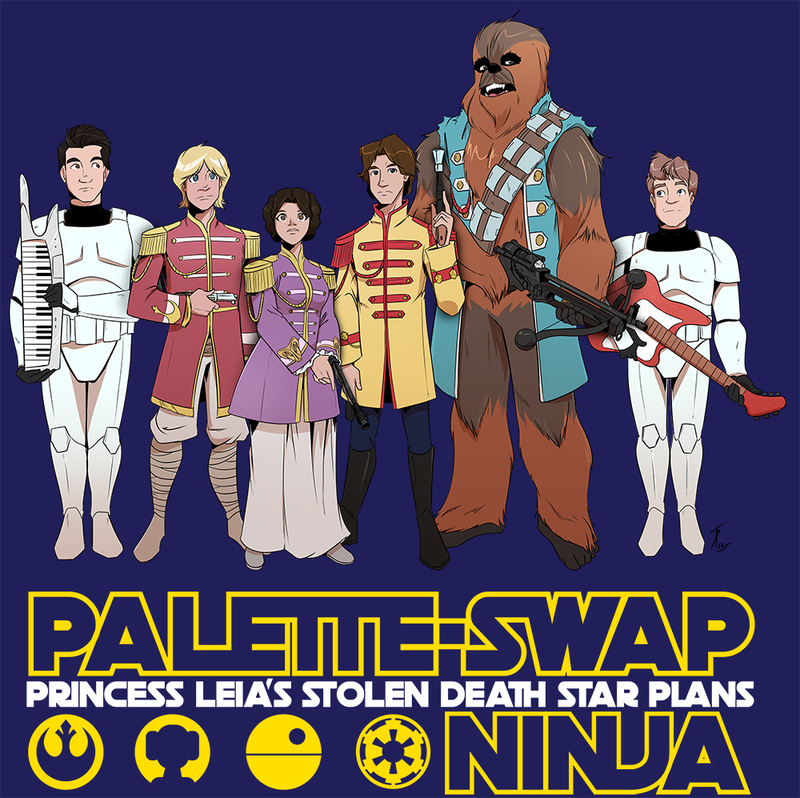 The artwork was created by Tony Baldini (he of Nerdy Show/Lightning Dogs renown) especially for this shirt. You choose the size! You choose the color! Your shirt will be shipped directly to you, no muss, no fuss. Shipping is $2.99 so we intentionally set the price for the standard shirt to be about $25 out the door. The shirts are all in a special section of our merch shop. But be warned: When the fundraiser is over, we are retiring this design. You only have until October 31, 2018 to get this shirt in any form. After that, it will disappear, like so many dead Jedi. And don’t forget — since you are donating to the cause, you get a link to the recording of the show in advance of its public release. We’re hoping to get audio and video, but let’s see what we can actually pull off! However, Spreadshirt does not reveal your contact info to us when you buy a shirt. Just drop us an email with your order number to make sure you’re on the list when we send out the early links. Truth is, we don’t like talking about money, let alone asking for it. We have always given away our music for free because we like making it and want to share. Heck, we found a non-profit orchestra that wanted to work with us, so any funds we raise beyond what we actually need to break even on this show are being donated to them. This is not about making profit, this is about making something cool together. Be the envy of both of your friends and get this t-shirt before it’s gone! Thanks for your support of the band, the event, and this fundraiser. 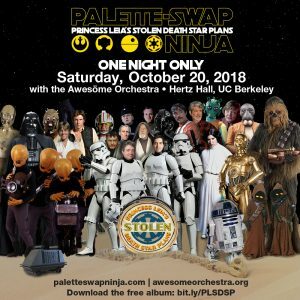 PLSDSP Live: October 20 in Berkeley! Here’s the info you’ve been waiting for! 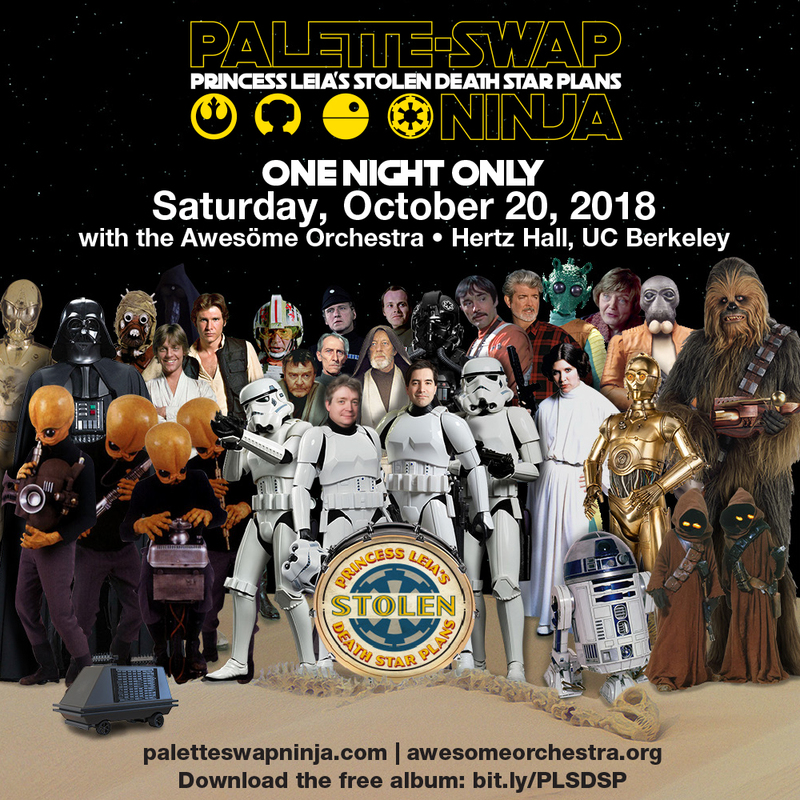 On Saturday October 20 we’re performing all of Princess Leia’s Stolen Death Star Plans live — with the full power of the Awesöme Orchestra Collective.— at Hertz Hall at UC Berkeley. And we need your help in making it happen! DONATE: If you just want to donate a few bucks, we have an account on PayPal — anything helps! All donors will receive a download link for the live recording of the show in advance of its public release, and your names will be included in the credits (if you want that). So please make sure you include your email of choice somewhere in there — we’ll assume it’s your PayPal address unless you say otherwise. UPDATE: VIP & VIP Plus tickets are no longer available — thank you for the enthusiastic support! Standard free seating is still available on a first-come basis. Doors open at 6pm! If you plan to attend in person, we’re setting aside the first few rows at $20 per seat. If you donate $20 through PayPal and specify that you want a “VIP ticket” (please note if you’re planning to attend with friends or family, you can get as many $20 premium seats as you want until they’re gone), we will have a VIP list at the door with your name on it. And if you really want to shoot the works, a super-generous $40 $30 gets you a literal front row seat second row seat plus a souvenir packet including a laser-cut PLSDSP keychain, a desktop R2 model, some PLSDSP guitar picks, a custom replica of the infamous plans themselves, and other goodies that we are still putting together. There are only a limited number of these special seats, so claim your “VIP Plus” package early! Same email contact rules apply — let us know where we can send you a link to the recording when the time comes. LIMITED EDITION T-SHIRT: If you cannot attend but you like getting physical stuff for your donation, we are selling a limited-edition t-shirt which will only be available for the duration of this fundraiser. It features a commissioned illustration by Tony Baldini of Lightning Dogs fame. (Since Spreadshirt doesn’t show us your email when you order, you’ll need to drop us a note with your order number so we know how to send you a download link later.) More info on the shirt is here. All the funds we’ve received so far from the release of the album are being applied to our costs here, but it’s not quite enough. That said, any funds we raise in excess of what we need to cover our costs go to the Awesöme Orchestra. Nothing will be wasted and we will not take advantage of anyone’s generosity. We just can’t pay for all of this out of pocket. We’ve put together an amazingly talented band with players and singers from around the country, plus the Awesöme Orchestra is appropriately named. They will also perform selections from John Williams’ film score as part of the show, and we have a few other fun things planned too. The venue seats more than 600 people, and the show will be appropriate for all ages. Cosplay is strongly encouraged! A splendid time is guaranteed for all. We are thrilled that we get the chance to perform the album live, and we are committed to doing this as well as it can be done. If you can help — either by donating some money or simply spreading the word about the event and the fundraiser — please do. It’s deeply appreciated. Here’s the Facebook event if you’d like to share a social media reminder for the event, and to spread the word about the fundraiser, just send folks to this page, please! We can’t wait for October 20!